A Culinary Pharmacy in Your PantryThe Cancer-Fighting Kitchen features 150 science-based, nutrient-rich recipes that are easy to prepare and designed to give patients a much-needed boost by stimulating appetite and addressing treatment side effects including fatigue, nausea, dehydration, mouth and throat soreness, tastebud changes, and weight loss. A step-by-step guide helps patients nutritionally prepare for all phases of treatment, and a full nutritional analysis accompanies each recipe. 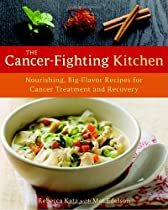 This remarkable resource teaches patients and caregivers how to use readily available powerhouse ingredients to build a symptom- and cancer-fighting culinary toolkit. Blending fantastic taste and meticulous science, these recipes for soups, vegetable dishes, proteins, and sweet and savory snacks are rich in the nutrients, minerals, and phytochemicals that help patients thrive during treatment.Whole foods, big-flavor ingredients, and attractive presentations round out the customized menu plans that have been specially formulated for specific treatment phases, cancer types, side effects, and flavor preferences. The Cancer-Fighting Kitchen brings the healing power of delicious, nutritious foods to those whose hearts and bodies crave a revitalizing meal.The Cancer-Fighting Kitchen took home double honors at the prestigious IACP 2010 Awards, named a winner in both the Health and Special Diet category and the People’s Choice Award.